After you’ve assembled your k8200 3D Printer Kit and have your 3D Model ready, use Velleman’s 3mm PLA or ABS filament to create custom parts, toys, chess pieces, phone cases, you name it! And with a large 3d printing area of 20 x 20 x 20 cm, you’ll only be limited by your imagination! But don’t just stop there! The Velleman K8200 kit offers numerous customizable upgrades, including an extruder for improved resolution, and Velleman’s Z-Axis expert precision upgrade. Looking for even more 3D Printing Capabilities? Velleman offers both ABS and PLA filament for use with your K8200 3D Printer. ABS is a tougher material, good for heat-resistance. PLA is a bit more flexible, and is a non-toxic filament. The K8200 accepts both ABS and PLA filament, however you must use size 3mm, unless you upgrade with the K8203 Extruder Kit, which will allow you to print using 1.75mm ABS or PLA filament, for improved resolution. I bought this kit from Velleman and coulding be happier! Building the kit was not too difficult and after a few nice modifications my machine prints out the most detailed and coolest designs. HIGHLY RECOMMEND buying this printer kit...you won't regret it!!! One word for this kit and that is AWESOME !! There is some care required in building but nothing that requires an immense amount of skill, just attention to detail as the assembly manual is over 600 pages. I built mine in stages over a week and had no missing parts. I bought it for home use as I like to create stuff using technology and this worked a charm, came very quick all in the box! The complete manual for the K8200. Explains how to build the kit and how to use the printer. 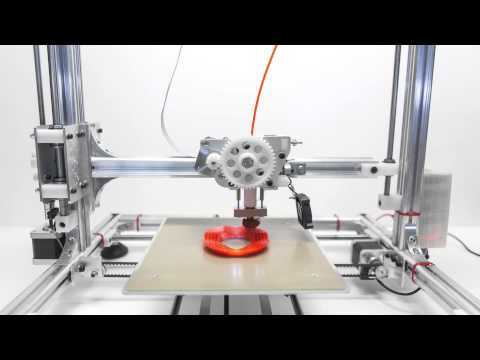 How to Transform your 3D Printer in a CNC milling machine. Version 2 of the k8200 firmware called Marlin based on Sprinter and grbl Reprap firmware. Copyright (C) 2011 Camiel Gubbels / Erik van der Zalm. This version supports the VM8201 (LCD and SD card controller. Contains all the .STL files for the VM8201 module enclosure. Use these clips (4x) to clamp the [product id=417314]GP8200[/product] glassplate tot the printing bed. Download our customized Repetier Host, install it and starting printing, it is easy as that. No more troubles with driver installation or fiddling with settings and config files. Slic3r configuration file for standard ABS prints. Consult the K8200 manual on how to use this file. This file is only compatible with Repetier 0.90 and Slic3r 0.9.10b. Make sure to read the FAQ\'s on how to get good result printing with ABS! Slic3r configuration file for standard PLA prints. Consult the [link url=downloads/0/assembly/assembly_manual_k8200_uk.pdf]K8200 manual[/link] on how to use this file. This file is only compatible with Repetier 0.84 and Slic3r 0.9.8. Slic3r configuration file for standard PLA prints. Consult the [link url=downloads/0/assembly/assembly_manual_k8200_uk.pdf]K8200 manual[/link] on how to use this file. This file is only compatible with Repetier 0.90 and Slic3r 0.9.10b. .STL 3D file for the board cover (needs to be sliced before you can print this file, see the manual how to do this). .GCODE file for the board cover (can be printed directly with a K8200). .STL 3D file for the fan nozzle (needs to be sliced before you can print this file, see the manual how to do this). .GCODE file for the fan nozzle (can be printed directly with a K8200).